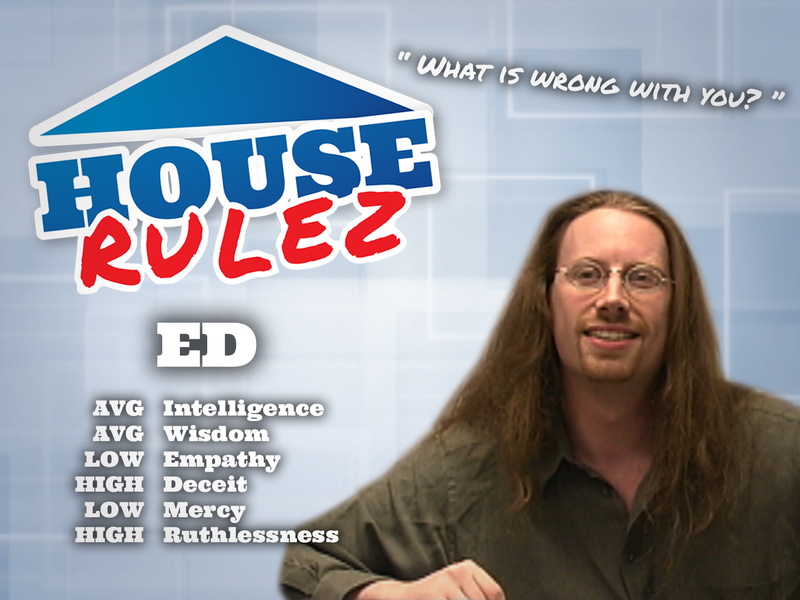 Now, free from prosecution, the creative force behind the cult-favorite series The Gamers, JourneyQuest, and Demon Hunters is proud to present to you the hilarious/appalling/unreal experience that is: House Rulez! Nearly done with her Communication major at Pacific Midwest University, Erika works part-time in a clothing store at the local mall. She transferred to PMU from its sister school in Tacoma, WA after an undisclosed incident on campus. Erika has a good heart, but few deep friendships–especially with other women. She auditioned for House Rulez after being approached by Steve (one of the producers) while she was helping him select a new hemp necklace to wear during the production. She suggested a twisted taupe one wrapped around a single verdant bead. She hopes that the experience of the show–and the interesting people she’s sure to meet–will help her figure out what to do next in life. 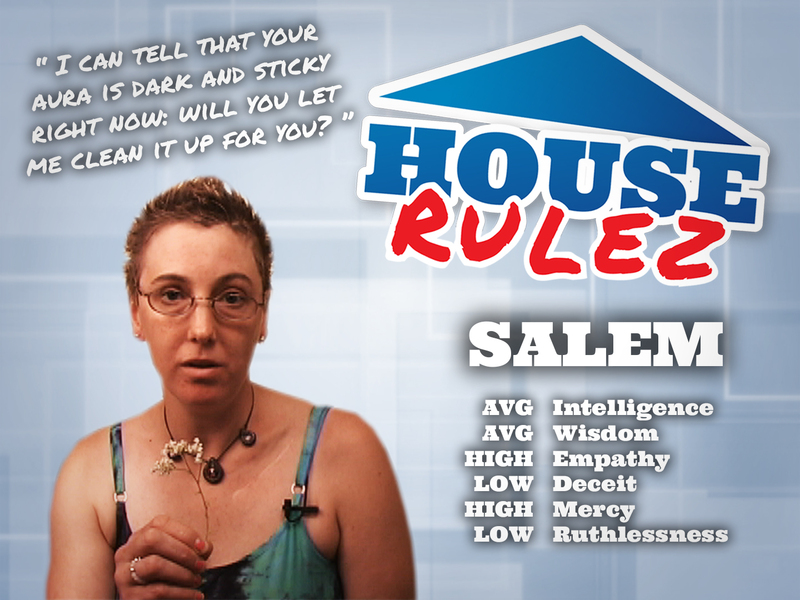 A naturopath and personal health consultant, Salem was initially reluctant to appear on House Rulez. However, after consulting her spiritualist and realigning her aura, she determined that her participation was vital to the karmic balance of the show. When not helping others with their own spiritual path of healing, Salem works freelance as an advocate for the National Cheese Safety Advisory Council on their “becoming tolerant of lactose intolerance” campaign. 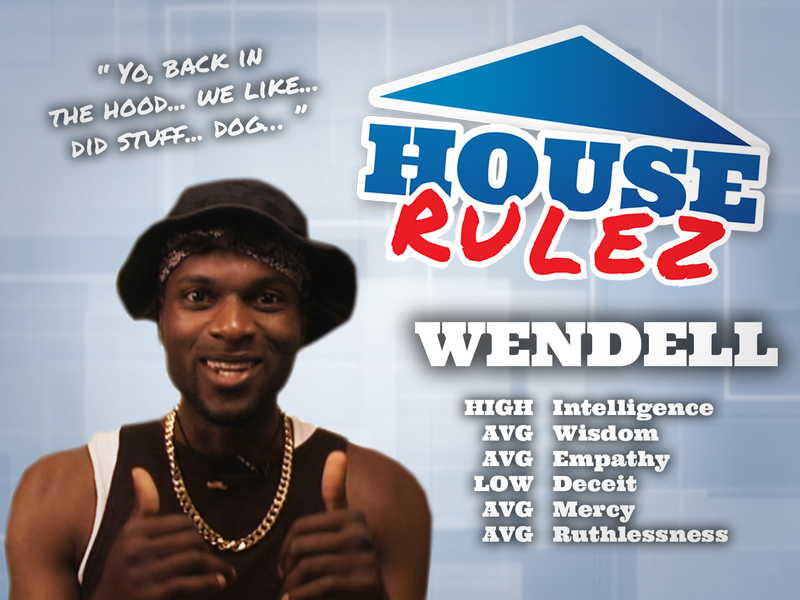 A systems analyst for Astronomyx, Wendell sees House Rulez as his chance to repay the student loans which landed him this coveted–yet overworked and underpaid–position. 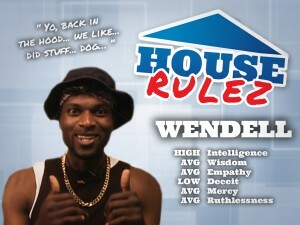 Acutely aware of his status as the only person of color in the house, Wendell devised a sure-fire plan to scare off the competition: adopting the persona of ThreePac, a streetwise gangsta from Detroit. In truth, the closest Wendell has ever come to visiting “the mean streets of Detroit” was as a child–when he used to play RBI Baseball as the Tigers. Wendell wants his mom to know that the earring is only a clip-on, so please don’t worry. The youngest member of the Institute for Irresponsible Science’s Cold Fusion Division, Evey joined House Rulez on a lark. At lunch one day, she overheard a pair of colleagues loudly debating the merits of various upcoming reality shows. 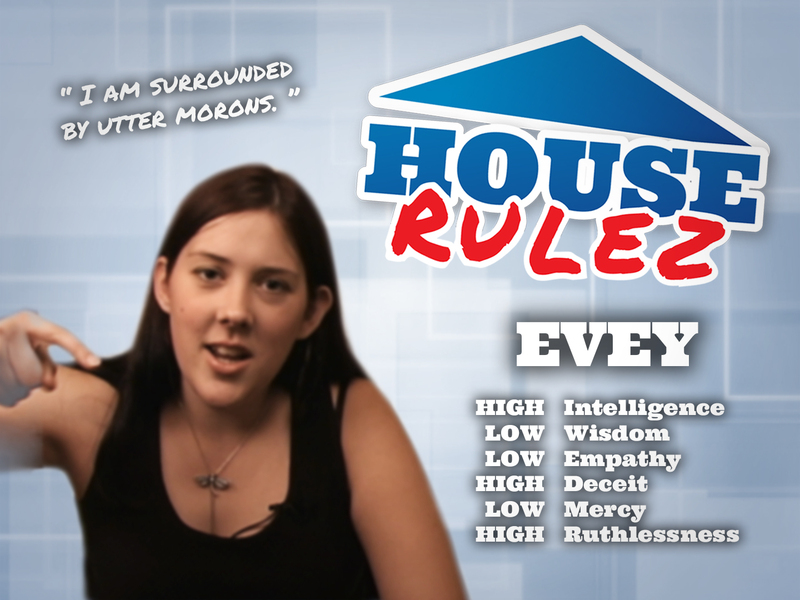 Disgusted at their passion, Evey lashed out and proclaimed that “anyone with half a brain” could win such a show if they applied themselves correctly. 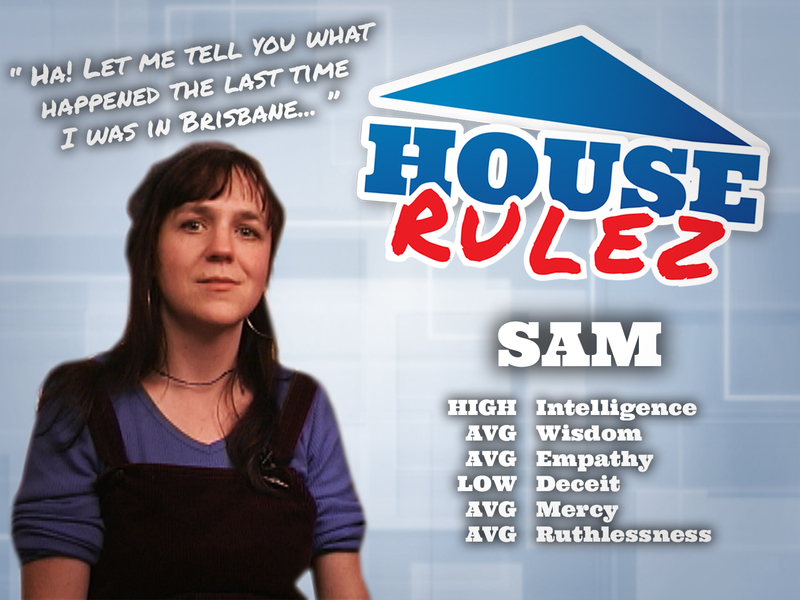 Seeing a chance to rid themselves of her for 2 months, her colleagues took the opportunity to strike up a bargain: if she could get on House Rulez and win it, they’d allow her primary authorship on their next paper. 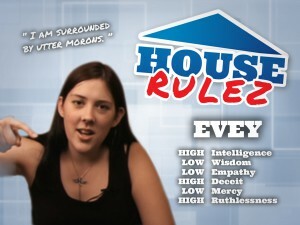 Calculating and vicious, Evey will stop at nothing to get that citation. Feisty and spirited, Sam has traveled the world by bartending her way across it. Don’t be fooled by her stature: she often serves as her own bouncer. She landed a spot on House Rulez when the producers held an open audition at her pub: not only did she drink the entire bar under the table, but she cleaned up the mess afterward. 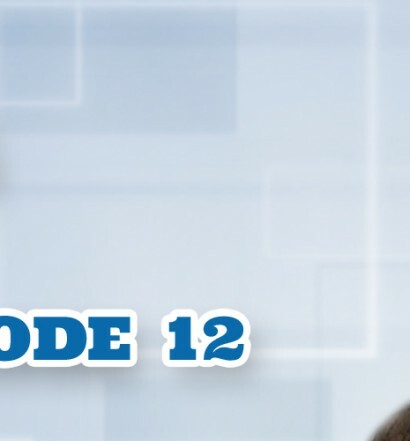 Though she doesn’t have kids, Sam is often looked at by her friends and coworkers as a maternal figure–someone they can turn to when things are bad, or blame when things are worse. Even though he’s now on the show, Thomas is ambivalent about House Rulez: he doesn’t watch TV, is uncomfortable around strangers, and generally prefers to keep to himself. Keeping his head low and staying out of the way is his approach: ideally, he’ll walk away from the experience with enough cash to branch out from his programming job and start his own consulting business–though that would mean more talking to strangers…so maybe that’s not such a good idea after all? 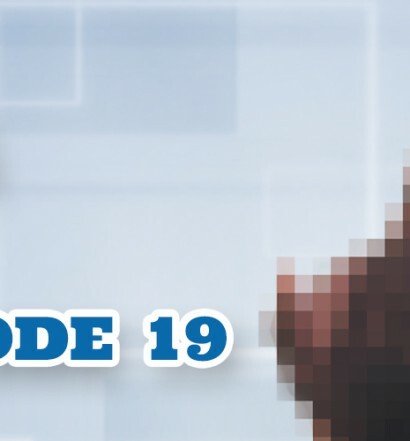 Despite his mild-mannered exterior, Thomas does have one unexpected hobby: beat-boxing like a champ. 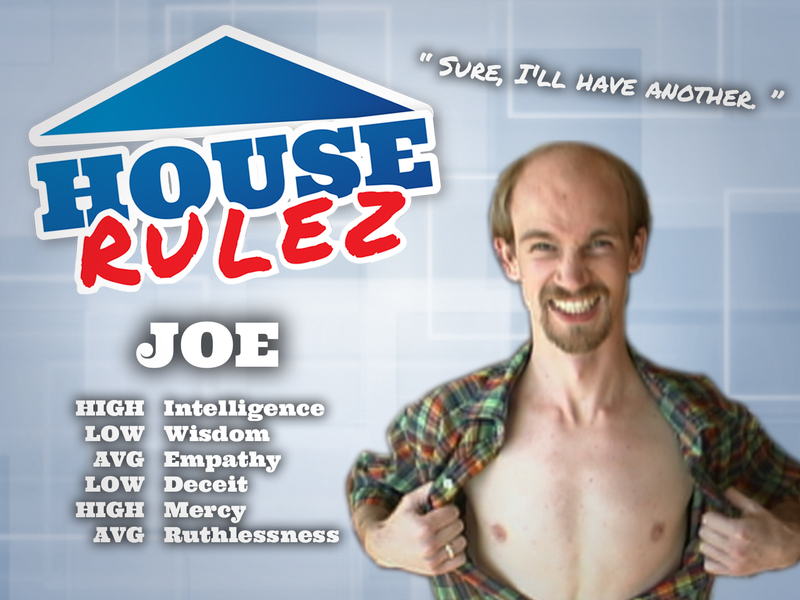 Bob is on House Rulez. Wait…who IS this guy??? 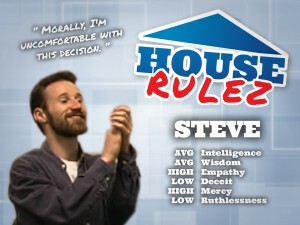 Steve transitioned into television production from a unique angle: he was an actuary for a production company’s insurance carrier. 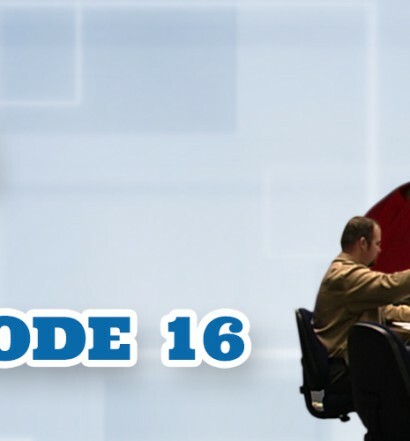 While visiting the set of a client, he revealed an uncanny ability to size-up the strengths and weaknesses of the various contestants–offhandedly predicting the eventual winner and 5 of the top 6! Intrigued, the company offered him an associate producer position, one focused on contestant selection and interaction. 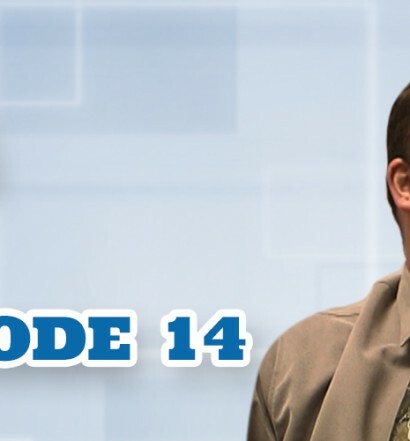 He has carved out quite a niche for himself in this area, and is frequently brought in as a special consultant. 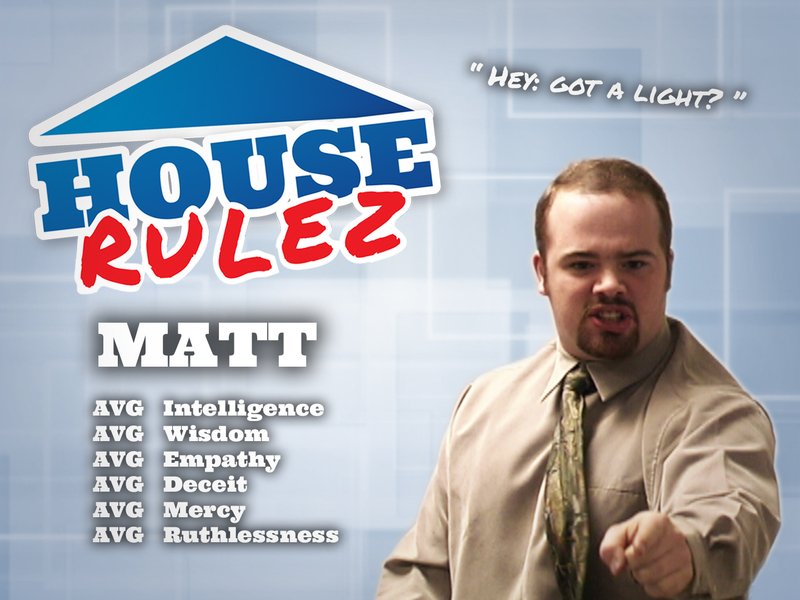 One of the producers of House Rulez, Matt got his start in the industry as a writer on the critically reviewed “Lust Vixens” series (he doesn’t like to talk about it). Increasingly frustrated by a lack of creative control, he eventually decided to move on to producing. Given the nature of his prior projects, however, finding willing backers was hard–only the budget-friendly confines of reality television beckoned. 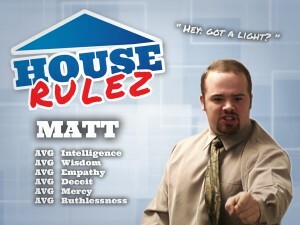 After a surprisingly successful run as an associate producer on “America’s Got People,” Matt was solicited to work on House Rulez. He’s determined to use this project as a springboard to bigger and better things. The bulk of Paula’s prior production experiences have been commercial-related: this is her first story- driven project. She’s achieved significant respect in the industry, however, with how she handled fallout surrounding her recent campaign for Cobblers Crystals. Her business partner/husband slipped in an edgy tagline without her approval: “Now that’s a g—— cup of coffee,” and some of the print ads were released before she could stop them. She managed to salvage her relationship with the client, though, by steering them into position as the leading coffee of the neo-pagan community and an official sponsor of the Demon Hunters RPG. Her marriage, however, was not so fortunate. Ed is determined to be on top. 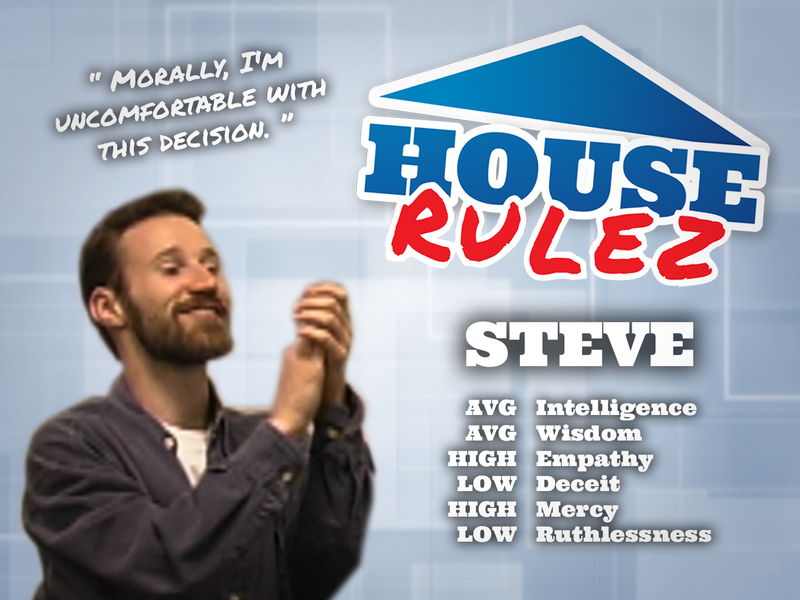 Arrogant, competitive, and ruthless, he’s known for destroying his subordinates while creating ratings darlings. His relationships–business or otherwise–are never smooth, but his results are undeniable. As such, he has had several lawsuits dropped when various production companies “encouraged” litigants to reconsider their filings. If everything goes according to plan, House Rulez will be his chance to launch his own production company, free of the need to deal with “lesser” producers. 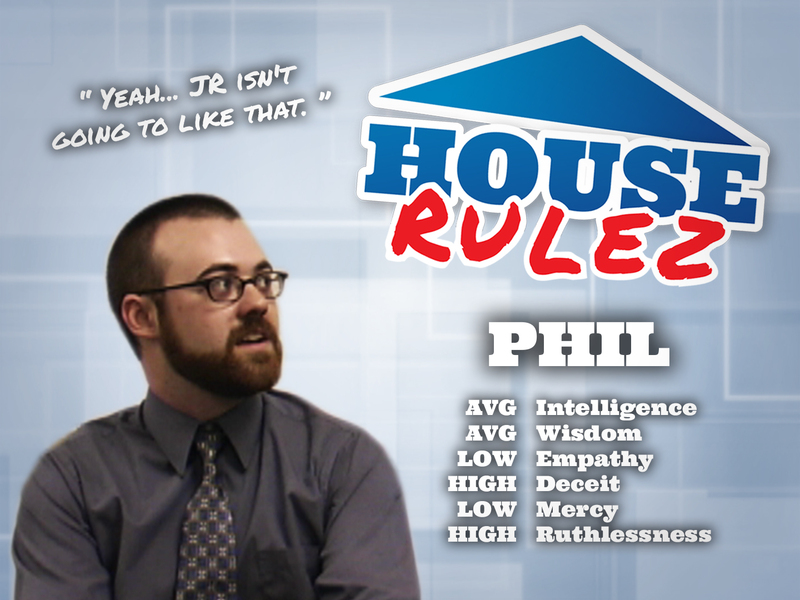 Phil started working with JR (the executive producer of House Rulez) soon after the latter inherited what would become his media empire. Friends since they were kids, Phil quickly became JR’s most trusted advisor and frequent liaison. Phil’s attention to detail and complete loyalty make him a de facto second pair of eyes and ears for his boss. 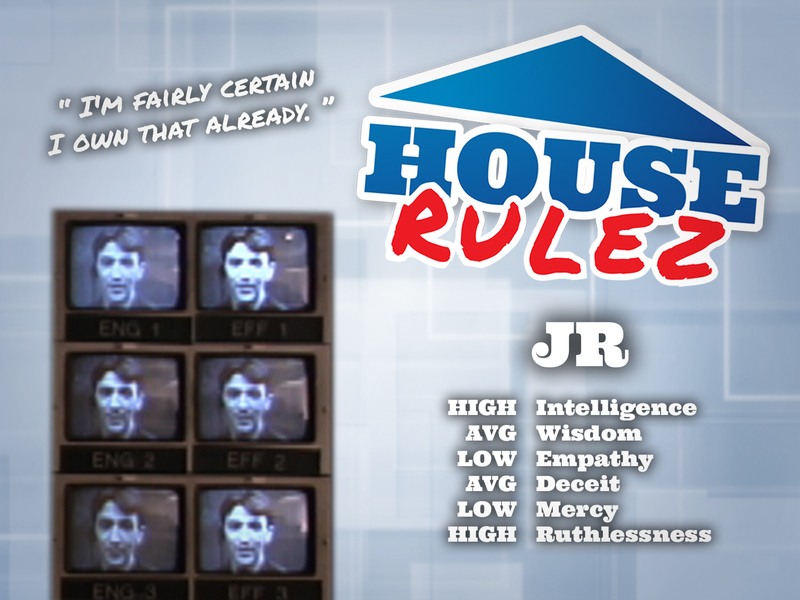 More calculating and vicious than he lets on, Phil delights in letting employees view him as merely “JR’s errand boy” while secretly setting them up for failure. 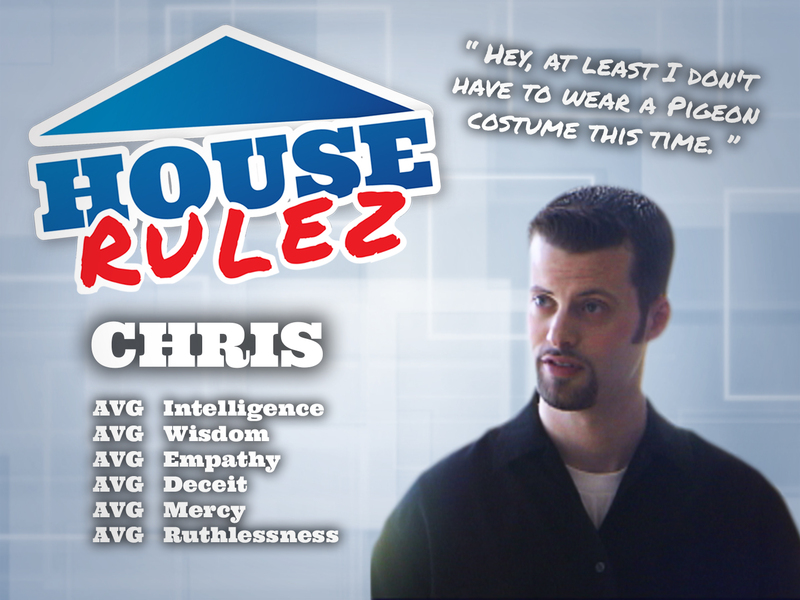 House Rulez is Chris’ return to American television following a lengthy stint in Japan as the host of “Happy Funtime Super Rad: Dance Dance Dance” and “Find the Pigeon.” While financially sustainable, the projects wore on him as they seemed so removed from his dream career: voice over work for NPR. 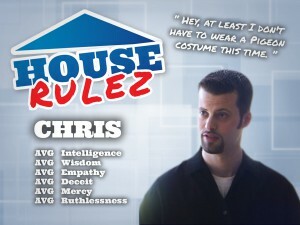 Ready for a change, Chris signed on as host of House Rulez after meeting Phil at an industry event in Los Angeles. His hope is that things go well, and he only has to slum in reality television for a single season. The sole beneficiary of his mother’s media holdings, JR has worked hard to transform them from a moderately successful collection of news outlets into a multi-billion dollar entertainment empire. 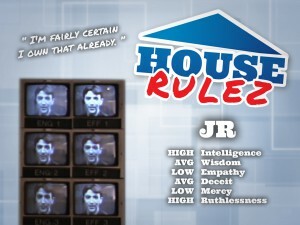 Despite his success, JR is frequently bored and seeks out opportunities to amuse himself by manipulating his underlings. He seldom shows up on-set, though, and prefers to use Phil as his primary means of communication with staff.